Communing with nature takes many forms. On a recent camping trip I couldn’t help but notice the names of the various trailers parked around us on the site. The older, more basic models had names like Discovery, Jay Feather, Wind Drift and suchlike suggesting a harmonious participation with the natural world. However, the more modern (and swankier) the homes-away- from-home became, the more aggressive the names were – Cougar, Viking, Trail Blazer – conquering, muscular, barrel-chested, hairy knuckled names evocative of triumph over nature rather than any engagement. I did notice one trailer called Citation which was somewhat bemusing. A triumph over nature indeed. But ..... why? It seems the further we get from the earthy experience originally sought by “getting away from it all” the more we have to convince ourselves that this is somehow winning, that we have achieved dominance over the earth and no matter how far away from civilization we are, we can still gather round our big screen TV and watch Die Hard in the evenings. It’s a strange way of “roughing it” and it seems to embody the prideful “I-don’t-need-anything-from-anybody” stance that capitalism encourages us to pursue. If I sound at all critical, I'm really not! I’m a little jealous perhaps. My idea of survival skills can be boiled down to making sure my phone is charged before leaving the house. However one thing I am good at is asking for help and I’m pretty good at giving help too. So why do so many conversations seem to start with “I hate to ask you this but …”. Now why on earth would anyone hate to ask for help? I believe we were made that way – humans are pack animals – we do not function well alone. We can survive, we can exist - but can’t really riotously thrive alone. We want All Saints to burgeon and flourish. If we are the church then dependence on ourselves alone is not on the cards. We want to support and provide for our community and can only do so if we in turn ask for their help. This congregation has responded magnificently to the call to further our mission and ministry and it’s time to spread the word further afield. 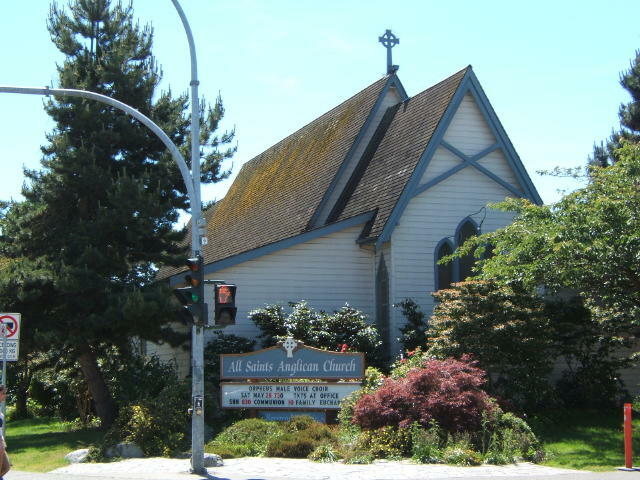 So let's talk about our church family and all that All Saints offers to Ladner. Church is not a building, it’s a living thing and as with all such organisms it needs constant love and encouragement to reach it's full potential. The All Saints family home is a beautiful monument to God's past, present and future work in Ladner. You are doing a great job in preserving it for the challenges to come. This Week's News- you Need to Read this!